Poultry is perhaps the most versatile of all meat products. From chicken to turkey (and everything in between) we have a wide selection of poultry products you're sure to love. 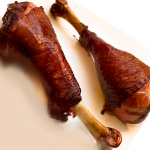 Whether you're looking for tender, meaty wings, a whole chicken for roasting, or a plump goose for a special dinner, our meat cutters will be happy to help you make your selection. Slow smoked to perfection. Full of flavor and ready to enjoy! Priced by the lb.